1. Pressing SCAN + ON/OFF keys simultaneously. 1. Pressing F1 + SCAN + On/Off buttons simultaneously. 1. Pressing F1 + SCAN + F2 + On/Off buttons simultaneously. 1. Perform a Cold Boot. 2. Quickly release all the buttons when the screen goes black. 3. Within 1 second, press and hold down ESC + 0 keys until the left orange LED starts blinking. 4. Release the ESC and 0 buttons. 5. Enter 1 to proceed with the clean boot sequence. Enter 0 to cancel the clean boot and proceed with a cold boot. 1. Press and hold the Power button until the device turns off. 2. Wait a couple of seconds. 3. Hold down the Power button again to switch the cell phone back on. 1. Remove the back cover and the battery for a few seconds. 2. Put the battery and the cover back in. 3. Turn on the phone by holding the Power button. 1. Hold down the Power button in order to switch off the mobile phone. 2. Find and select Settings. 3. Afterwards choose Security and tap Factory Settings. 4. Highlight option Restore factory default and confirm be tapping OK.
5. To begin the whole operation enter the conﬁrmation code: 1234. 6. The hard reset is performed. 1. 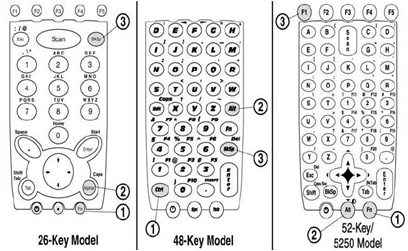 Press and hold the Yellow Key, Blue Key and ESC Button simultaneously. 1. Turn off the Skorpio X3 by pressing the ON/OFF Power button. 2. Pull the battery latch down and remove the battery pack. 3. 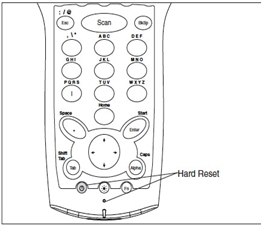 Simultaneously press the SCAN key and the Reset button in the battery compartment. 4. Insert the battery pack. 5. Turn on the Skorpio X3 by pressing the ON/OFF Power button. 2. Press and hold down the Esc + 0 keys simultaneously, prompty after resetting. 3. A dialog box will appear asking for confirmation. Press the Enter Key. 1. Press the Scan Button, Yellow Key, and Blue Key at the same time. 2. Release the keys once the Datalogic Splash Screen appears. 1. Press the Scan Button, Yellow Key, Blue Key, and the Down Arrow Key at the same time. 1. Press the ESC button and the Power button simultaneously. 1. Press the ESC + ENT + Power buttons simultaneously. 5. Enter 1 to proceed with the clean boot sequence. Enter 0 to cancel the clean boot and proceed with a cold boot. 1. Press and hold the ESC button and the Power button at the same time. 1. Press and hold the ESC, Joystick and Power buttons at the same time. 1. Simultaneously press F1 + F2 + ENTER. 2. Press with a pin or a paper clip the cold boot button on the back of the mobile computer. 1. Simultaneously press SCAN + ENTER. holding both keys down for few seconds. 3. Press ENTER to confirm. 1. Press and hold the Yellow Key, Blue Key and Red Disconnect Button simultaneously. 1. Turn off the Elf by pressing the ON/OFF Power button. 3. Press the Reset button. 5. Turn on the Elf by pressing the ON/OFF Power button. 2. Press and hold down the 0 and Red Disconnect buttons simultaneously and then press the ON/OFF key. 3. A dialog box will appear asking for confirmation. Press the Enter button. 1. Turn off the Lynx by pressing the ON/OFF key. 5. Turn on the Lynx by pressing the ON/OFF Power button. 1. Perform a Warm Boot. 2. Before the splash screen appears, press and hold down the 0 and Red Disconnect buttons simultaneously. 3. A dialog box will appear asking for confirmation. Press the Enter Key to confirm. If you wish to cancel the clean boot, press Esc by pressing Blue + Red Disconnect buttons. 1. Turn off the Falcon X3 by pressing the ON/OFF key. 5. Turn on the Falcon X3 by pressing the ON/OFF Power button. 2. Press and hold down the 0 and ESC keys simultaneously and then press the ON/OFF Power button. 1. Press and hold the Reset Button simultaneously. 1. Simultaneously press the Reset button with the stylus while pressing the FN2 button. 1. Press and hold Fn + Alpha +Bksp buttons. 1. Press and hold Ctrl + Alt +Bksp buttons. 1. Press and hold Alt + Fn +F1 buttons. 1. 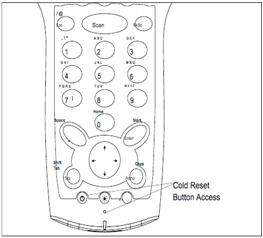 Insert a paper clip into the cold Reset button while pressing the Power button. 1. Press and hold Ctrl + Alt +Del buttons. 1. 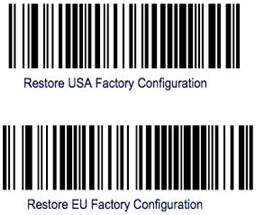 Scan the Restore Custom Default Configuration barcode below. and want to restore the Factory Configuration, you have two options.